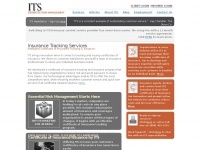 Certificate Tracking - ITS provides third-party certificate of insurance tracking and issuance services. The web server with the IP-address 184.168.156.108 used by Certificatetracking.us is owned by GoDaddy.com, LLC and is located in Scottsdale, USA. This web server runs a few other websites, mostly in the english language. The websites of Certificatetracking.us are served by a Apache server. The markup language of the website is XHTML 1.0 Transitional. Both the inclusion of the website in search engines and follwoing of its hyperlinks is explicitly allowed.